We are excited to announce the arrival of Personalized Bamboo Sunglasses! Now available in for custom printing, branding and weddings; you may now purchase by single color our popular Wood Wayfarers in either translucent brown or matte black! You can also purchase Personalized Wood Wayfarers in pre-mixed units of twelve pieces that include translucent brown and gloss black. 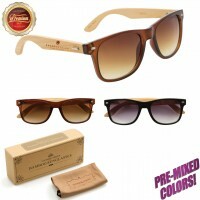 Also available are several other styles of wood sunglasses; all featuring Premium Hand-Sanded Bamboo Temples! All styles of Bamboo Sunglasses include light tan microfiber bags and individual folding boxes; making them an absolutely fantastic and classy wedding favor for guests!